My name is Tyler Pardoe. I am a senior in the Agricultural Sciences major three weeks into my internship with the Cornell Nutrient Management Spear Program (NMSP). The NMSP team works to conduct research in both the field and lab in order to provide New York’s farmers with current, reliable, and practical knowledge that they can easily implement on their own farms. Quirine Ketterings is the professor that heads the program, and the team consists of a research assistant, three doctorates who help with research, and two lab technicians. There is also another intern that works with me, so a team of nine. I’ve learned a lot of awesome things in three weeks and it’s reflecting in how I work with the team. So far, most of the work has been at the Musgrave Research Farm near Aurora (about halfway up Cayuga Lake). 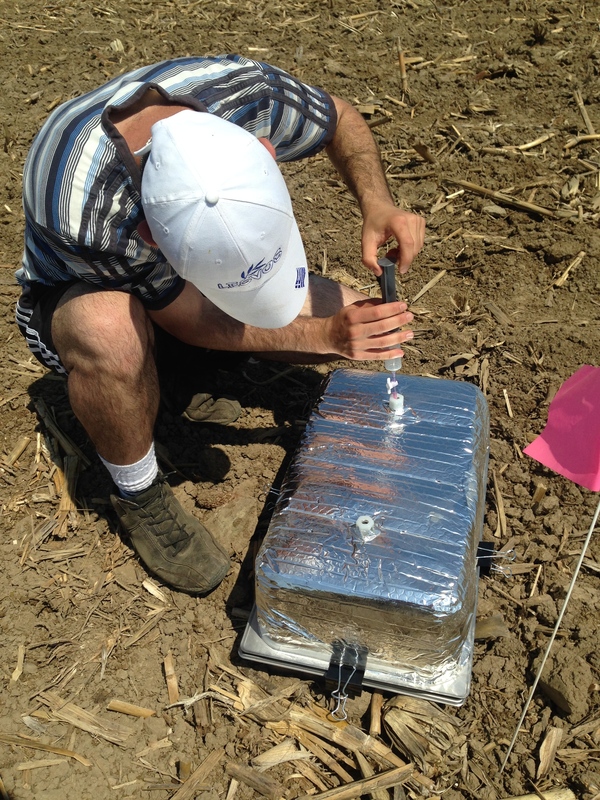 The first day, we started measuring nitrous oxide and methane (both greenhouse gasses) emissions from the soil on plots with different manure applications. This process involved a lot of planning, setup, and precise work, so it was a bit overwhelming at first. Now, I’m teaching some of the other doctorate researchers how to do the sampling, so that shows how much I improved in a short time. The first day was a bit rough, partly because everything was new to me, but also because I had to take 300 8″ deep soil core samples. In 90 degree weather, that tends to sap the life out of you. However, I came back the next day ready to persevere through the task, and now I could take those pesky soil samples with both eyes shut (though I haven’t tried). We also did a little bit of alfalfa sampling in plots with different sulfur and manure treatments. At the end of that first week, I was much more comfortable with the team, the work, and the overall lessons we were trying to learn with our research. That pretty much sums up the first week– emissions sampling and soil sampling. 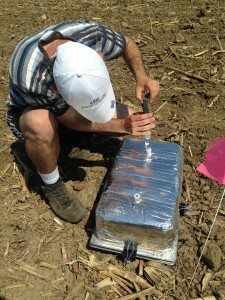 The second week I helped prepare fields for new experiments. 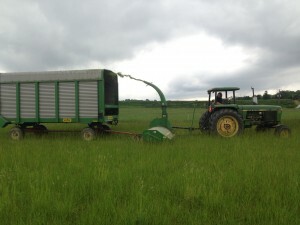 This was a nice change of pace and I got to use my farm machinery skills. 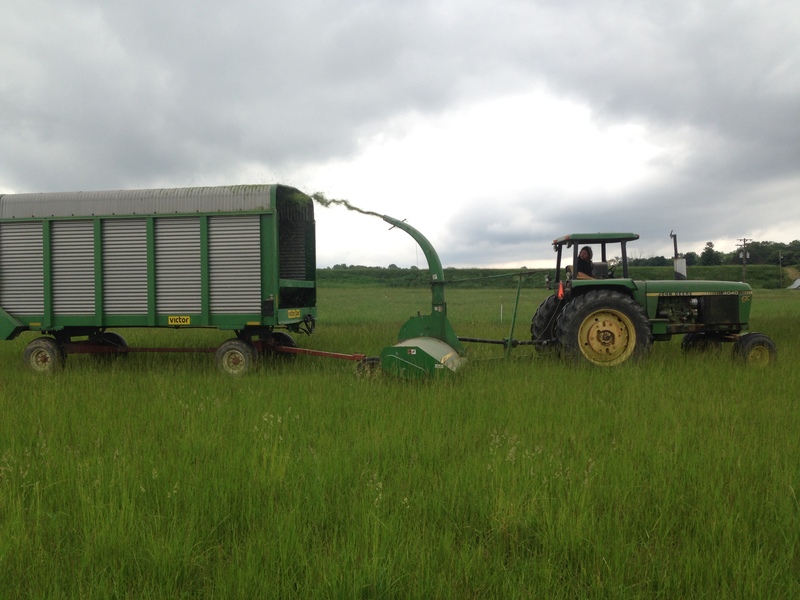 My first goal was to mow down a grass field and an alfalfa field in preparation for a new manure study. I used a tractor with a hay chopper and wagon hooked to the back of it to accomplish this. After about 10 hours of mowing, the fields were ready for the new emissions tests. We also continued our normal emissions testing schedule in the first experiment during the second week. The third week is when our plates started getting a little full. On top of the first emissions experiment, we had two more fields that were each about half the size of the first, so we basically doubled our work. We now regularly spend eight hours sampling the emissions, so we’re getting pretty good at it. On top of that, we had to take a day to drive about two and a half hours west to Castile, NY to take soil and alfalfa samples from an area dairy farm. It’s now the start of the fourth week, and I don’t look for our workload to decrease anytime soon. I’m learning a lot. I also know that there will be a lot of interesting things for me to discover in the coming weeks.